Kim Bauer speaks during forum. Last week, Main Street Portsmouth and the Portsmouth Area Chamber of Commerce successfully hosted the first event of a new quarterly series that promotes local events and progress, which has been coined as Portsmouth Today. The calendar mentioned by Pratt is the Portsmouth Area Chamber of Commerce event calendar on Portsmouth.org that is overseen by the Chamber, Scioto County Visitors Bureau, Main Street, and more, in attempt to organize the many events and promotions going on in the community. It is updated monthly and kept online, or available in print form all over the county. Carver mentioned that the event was thought of well by her board members who were present. Pratt said that he also had a few of his board members and volunteers present. Portsmouth Today had over 40 people in attendance, with progress heard from representatives from Main Street, the Chamber, the Visitors Bureau, River Days, SOMC, CONNEX, Portsmouth Area Children’s Theatre, Friends of Portsmouth, the American Red Cross, and Roy Rogers Festival. Everyone kept to a firm time frame to run over highlights and a social period was held following the meeting. Other organizations were also present who couldn’t be fit into the agenda, such as Shawnee State University, KDMC, Boneyfiddle Project, and more. These groups were all welcomed to hand out materials to get their news out there as well. “Moving forward, we will continue to work this event into the perfect forum that covers what people are interested in, but also provides a vehicle for additional information that people need to know about,” Pratt said. Main Street Portsmouth and the Portsmouth Area Chamber of Commerce are both in the Scioto County Welcome Center, along with partner Scioto County Visitors Bureau. They can be reached there, or by telephone. Pratt is available by email at director@mspohio.org. Carver is available by email at lcarver@portsmouth.org. 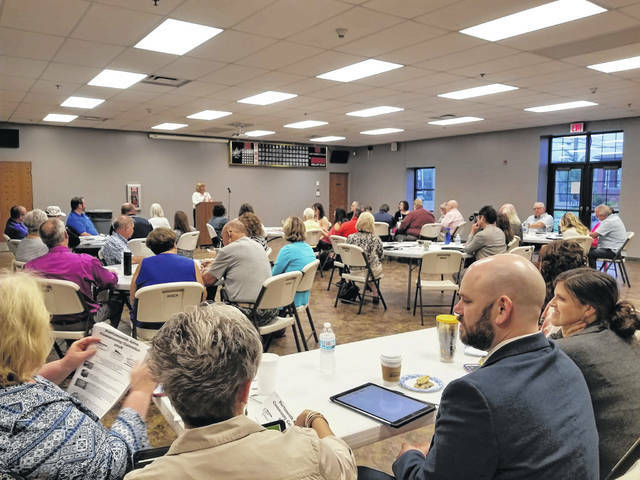 The next Portsmouth Today is slated for Wednesday, September 12, at 9 a.m, in the Scioto County Welcome Center. The room is provided by the Scioto County Community Action Organization. https://www.portsmouth-dailytimes.com/wp-content/uploads/sites/28/2018/06/web1_TODAY_ne2018618131558530.jpgKim Bauer speaks during forum.